The photo above shows twenty-seven of the physical books I read – one was borrowed from my friend and three were read on my kindle. I read them, I reviewed them – not an enormous feat to be true, thousands of book bloggers do the same thing every day. 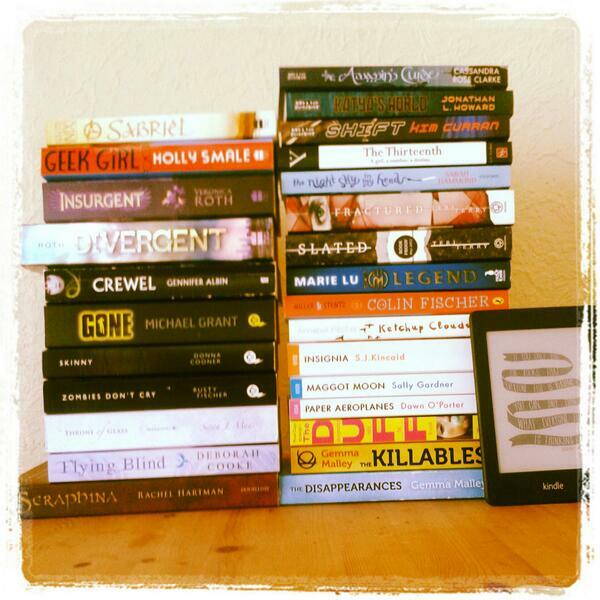 The main difference here is that I read these thirty-one books … in thirty-one days. What’s it about? It’s 1994 in Guernsey. Flo is friends with the domineering, horrible Sally, whilst Renee tags along with Carly and Gem. They weren’t really supposed to be friends but Renee and Flo are united by their unseen similarities and events beyond their control. It’s the power of friendship at a time when anything can happen. What’s it about? For decades an extremely fragile peace has existed between humans and dragons, but in the run up to the signing of a new treaty the Crown Prince is killed in circumstances that seem awfully like the dragons had a hand in it. In the midst of this is Seraphina, a gifted musician and the daughter of a dragon and a human. Forced to hide her true lineage she is nonetheless drawn into the investigation into the murder and along the way uncovers a much darker plot … one that threatens everything.